Firms Should be Aware of the Privacy Concerns and Implications of Notifying Third Parties as it Relates to Financial Exploitation and Diminished Capacity. Develop Communications Strategies to Engage Customers and Clients on Issues Related to Advanced Planning, Including the Implementation of Advance Directives. Develop Policies and Procedures that Allow Clients and Customers to Utilize Customized Advance Directives or Designate Trusted Contacts and Direct What Information Can be Shared and the Conditions Leading to the Sharing. Ensure Policies and Procedures Related to Third-Party Notification are Designed to Promote Compliance with Federal and State Law. Notifying trusted third parties about diminished capacity concerns or unusual or potentially exploitative activity occurring in a senior investor’s account can be an additional effective tool to assist in addressing harmful conduct. 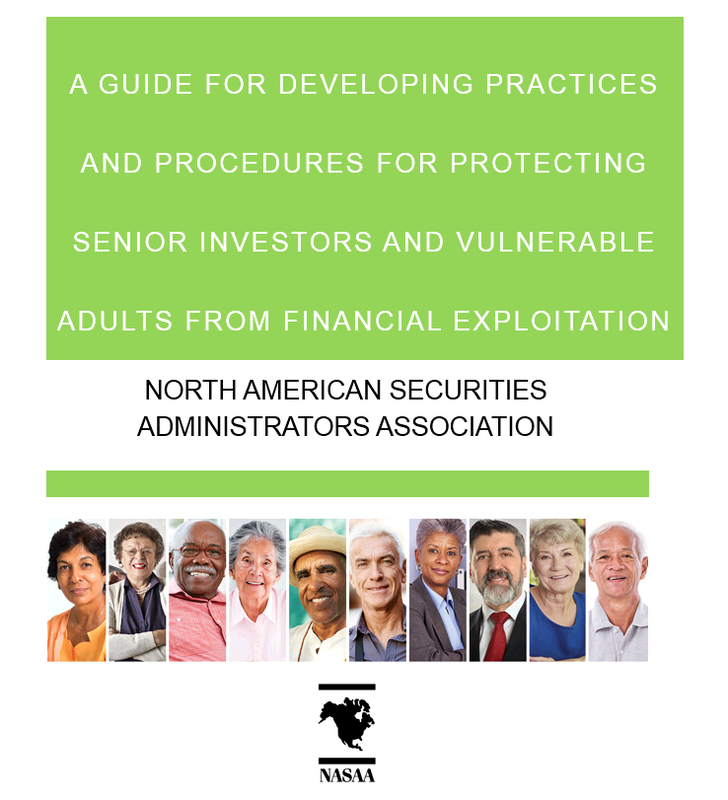 However, notifying third parties about the financial activity of a senior investor presents many challenges, requiring broker-dealers and investment advisers to implement clear policies to ensure that the concerns of both financial services providers and customers are addressed well in advance of the situation arising. Sharing financial and other potentially sensitive information with a third party is a delicate subject that raises significant privacy concerns. Before broker-dealers or investment advisers share information with third parties, including a client’s family members, firms need to carefully consider potential ramifications of doing so. For example, federal privacy laws generally prohibit the sharing of financial information unless a client or customer has consented or another exception exists. Further, sharing sensitive financial information with third parties, including family members, presents challenges as firms may not know all of the details of the relationship with the third party or family member or family members may be the suspected abusers. Firms, however, can overcome some of these challenges by implementing proactive disclosure and contractual advance directive measures early in the relationships with clients and updating them as appropriate. Developing strong relationships with investors is one of the most important weapons in detecting diminished capacity and in the fight against financial exploitation. Building strong client relationships and planning for more than the client’s financial future in isolation before potential issues arise is critical, and particularly important as it relates to third-party notification and advance directives that memorialize a client’s chosen course of conduct when faced later with diminished capacity or financial exploitation. Firms should implement policies and procedures and related training programs that require disclosure, discussion and decisions regarding plans for potential future issues, and develop communication tools that emphasize the importance of future planning. These tools should facilitate discussions to guide the customer toward memorializing advance financial directives and a contingent power of attorney, or other appropriate devices. However, clients can be very resistant to these discussions and, consequently, reluctant to commit to such recommendations. The firm’s communication strategies should address this likelihood by developing internal escalation procedures to help further educate customers and clients about the importance of such advanced planning. One potential strategy reported to be successful by financial professionals is to engage clients and customers on the topic of planning for medical emergencies generally in lieu of a specific discussion focused only on cognitive decline or financial exploitation. This approach could then grow into a discussion of other advance safeguards, with clients more willing to commit to the designation of their “financial agent” or “in case of” contact should the need arise in the future.likelihood by developing internal escalation procedures to help further educate customers and clients about the importance of such advanced planning. Firms should ensure that their employees are familiar with documents such as powers of attorney and advance financial directives, including the features and limitations of each. Policies and procedures should allow clients and customers to utilize customized advance directives or designate trusted contacts and direct what information can be shared and the conditions leading to the sharing. Because these measures are based on client consent, they can be tailored to fit the needs of specific clients and firms. Also, because clients consent to the sharing of such information under certain circumstances, firms that utilize advance directives or trusted contact procedures can minimize many of the privacy concerns discussed previously. The concept of designating trusted contacts is incorporated into the NASAA Model Act. Broker-dealers and investment advisers may only contact previously designated third parties about potential financial exploitation of an eligible adult. The NASAA Model Act’s third-party disclosure provision requires the client or customer’s consent, while some existing state laws allow for the notification of certain third parties without consent after a report has been made to the proper governmental agencies. Firms should be sure their policies and procedures are designed to ensure compliance with the applicable state and federal law. Many of the federal privacy law concerns stem from provisions in Title V of the Gramm-Leach-Bliley Act, 15 U.S.C. 6801 et seq., and its implementing regulations such as the SEC’s Regulation S-P, 17 C.F.R. § 248.1 et seq. See, e.g., Mo. Stat. Ann. § 409.610.